Yushan Yan has received the Electrochemical Society (ECS) Energy Technology Division Research Award for 2018. Yan is a Distinguished Engineering Professor and Associate Dean for Research and Entrepreneurship in the University of Delaware’s College of Engineering. The Electrochemical Society advances electrochemical and solid state science and technology. Its Energy Technology Division focuses on energy conversion through technologies such as fuel cells, electrolyzers, flow batteries, and more. The ECS Energy Technology Division Research Award recognizes researchers whose achievements will likely impact future research and development in the field. Yan leads and contributes to multiple projects funded by the Department of Energy. In 2017 alone, his research group has secured more than $5 million in research funding. Much of Yan’s research focuses on fuel cells, an eco-friendly power source. Multiple carmakers are developing vehicles that run on fuel cells instead of internal combustion engines, since the latter types emit pollution. Fuel cell cars offer another benefit—they don’t have to be plugged in. Yan is tackling a challenge that has slowed the widespread development and adoption of fuel cell vehicles: the relatively high cost of fuel cells. As part of this effort, Yan is zeroing in on fuel cell membranes and catalysts. The membranes, currently made of a polymeric material called Nafion, need the assistance of an expensive catalyst to spur power-generating electrochemical reactions. Often this catalyst is platinum, a precious metal, which can stand up to the acidic environment inside fuel cells. Yan is developing membranes made with a Nafion substitute that shifts the environment within fuel cells from acidic to alkaline. Termed by him as hydroxide exchange membranes, these can employ less expensive metals, such as nickel, as catalysts instead of platinum. Yan also aims to make fuel cells more eco-friendly and sustainable. 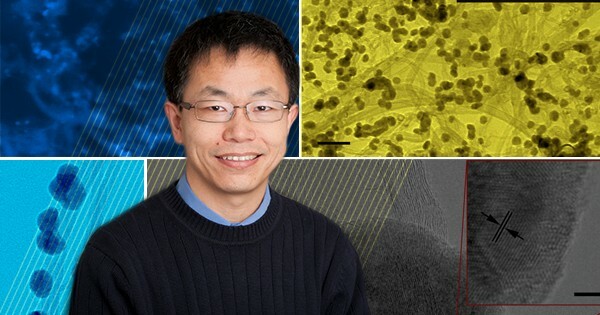 He is looking for greener ways to obtain hydrogen—the gas that fuel cells convert into electricity. Now, hydrogen is usually obtained from natural gas. Under a new project through the Department of Energy’s Energy Efficiency and Renewable Energy, Yan and collaborators from Northeastern University and Advent Energy are developing methods to do that. Yan received his B.S. in chemical physics from the University of Science and Technology of China and doctorate in chemical engineering from the California Institute of Technology. He also studied heterogeneous catalysis at the Dalian Institute of Chemical Physics of the Chinese Academy of Sciences. He worked for AlliedSignal Inc., as senior staff engineer and project leader before beginning his academic career at the University of California Riverside. He joined UD in 2011. Yan has been an inventor on more than 25 issued or pending patents. He is also the co-founder of several startups including OH-Energy. NanoH2O commercialized his nanocomposite desalination membrane technology. He has more than 200 published articles, which have been cited more than 18,000 times, according to Google Scholar.